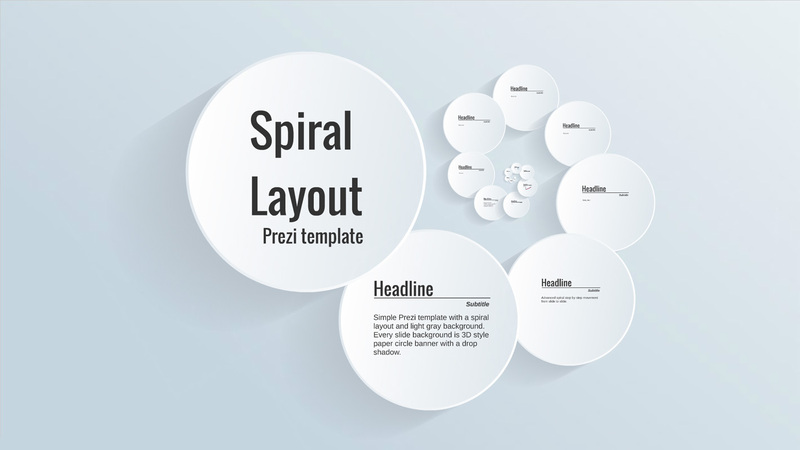 Spiral Layout prezi presentation template. Simple Prezi template has a spiral layout and light gray background. Every slide background is 3d style Paper circle banner with the drop shadow. Advanced spiral step by step movement from slide to slide. This entry was posted in Best Prezi presentation templates and tagged 3-d, 3d, advanced, and, backgound, backgroud, background, backround, banner, Best Prezi presentation templates, by, circle, dowload, downlaod, download, Download light presentation, download prezi, downloadprezi, drop, dropshadow, from, gray, ios, is, layout.